Spot, spot! the lovable pup! hey guys! 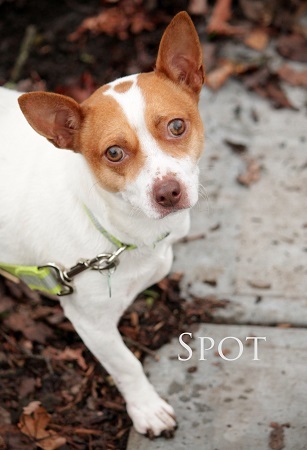 I’m Spot, you probably recognize me because I’m always the first one on the playground. Is it recess yet? Jump rope, frisbee, hopscotch, baseball I do it all! I love to be silly and play with my friends. Everyone always wants me on their team because i’m great at sharing with other dogs. I turned 3 this year and all my friends came to my birthday party because i’m super friendly! Im a Chihuahua/Jack Russell mix with a big spot on my back so you can always “spot” me right away. This kinda makes it difficult to play hide and seek…. but oh well! there are so many other games to play. Whats your favorite game? Will you teach me? Contact Pixie Project to schedule a play date with me! And if your Mom says it’s ok I’d love to come home with you. I’m vaccinated, neutered and microchipped. My adoption fee is $220. Lets be buddies!